and was built on the Unimat in less than 3 months for about £35. Sugar is a freelance design in 2½ in. gauge, designed using my valveless engine units and simplified in many ways to enable the beginner to tackle the job easily, and the expert, quickly. All work was carried out on the Unimat 3 lathe where possible, otherwise by hand and sweat of the brow. Boiler 2" diameter x 3½" long, round top, 70psi, coal fired. 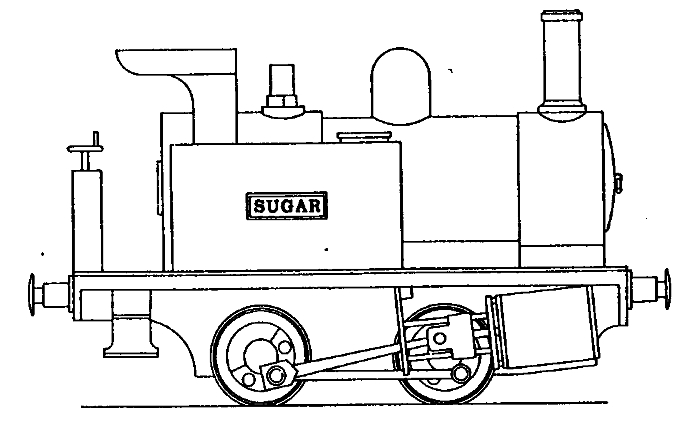 Instructions for building Sugar appeared in The Model Engineer, issues 3575-9, 3580-1, in 1977-8.